On this tropical adventure we cruise between Thailand's idyllic islands in the southern Andaman Sea, spending time on Koh Yao Noi, Koh Lanta and Koh Hai as well as mainland Krabi. We have time to swim and snorkel in warm tropical waters against a backdrop of craggy limestone outcrops that are dotted through Phang Nga Bay. 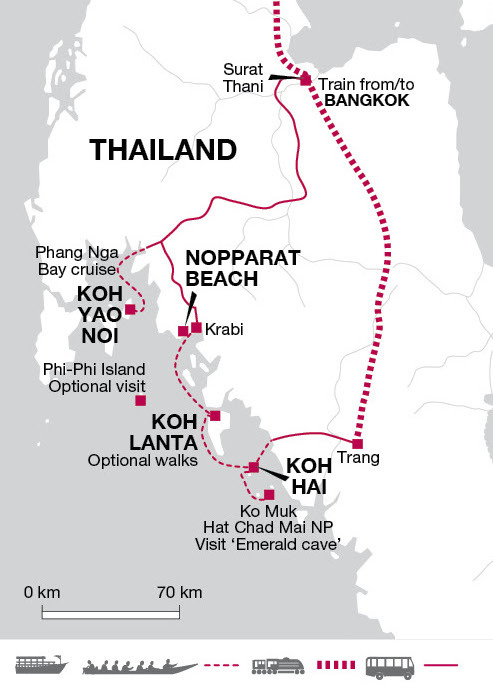 We can visit the secret Emerald Cave, and learn to cook a delicious Thai meal or simply relax on beautiful white sand beaches under the shade of a swaying coconut palm. Arrive Bangkok and check in at the hotel. The rest of the day is free. You may choose to take an optional cruise along the city's Klongs (canals) in a traditional longtail boat. This is the ideal way to explore Bangkok's network of meandering waterways that branch off from the main channel of the Chao Phraya River. The excursion will also include visits to the Royal Barge Museum and the iconic Wat Arun, the Temple of the Dawn, which was built to represent the towering slopes of Mount Meru, the home to the gods of Khmer mythology. Travelling on foot this morning we head for the magnificent splendour of the Grand Palace, where we enjoy a tour of the site in the company of a local guide. Dating from the latter years of the 18th century, this huge edifice represents the emergence of the Thai nation once more from under the yoke of Burmese oppression. It is opulence on the grandest scale and is almost certainly the most impressive site in the city, with its unrivalled collection of palaces, golden stupas, wats (temples) and ornately decorative statues. The most impressive of the wats within the palace grounds is Wat Phra Kaeo (The Temple of the Emerald Buddha), where we find the small jade statue of Buddha, believed to have been created in Sri Lanka and reputedly discovered when a lightning storm split open an ancient chedi in the northern town of Chiang Rai during the early years of the 15th century. Reputed to contain fabulous powers it is still worshipped by Thais, from the king down, to this day. After our visit we continue on foot to the rambling complex of Wat Po, older even than the city itself and home to the fabulous reclining Buddha, a 46 metre golden plated statue depicting Lord Buddha as he enters Nirvana. We will have some free time to enjoy the delights of Bangkok before we head to the station, to get our overnight sleeper train to Surat Thani. We arrive at Surat Thani and if time allows we can enjoy a walk around a local market before driving south to the pier to board a private long tail boat, depending on group size we may have more than one boat, for a lazy cruise through picturesque Phang Nga Bay to our first island of Koh Yao Noi. As we make our way through a seascape dotted with craggy limestone islands we will make a couple of stops to visit small islands, so that we can enjoy the beaches and warm waters of this idyllic part of Thailand. We arrive at Koh Yao Noi in the mid afternoon and take a short drive in a local truck to our hotel base for the next two nights. Today is free for you to either relax under the shade of a palm tree or choose from a number of optional excursions including hiring a bicycle and cycling around the island to learn about daily life on the island; or kayaking to nearby islands; or taking an island tour to see a rubber plantation, rice farming and other local industries. Your tour leader will discuss various options with you. This morning we transfer by local truck to the pier where we board a public long tail ferry to Ao Thalene pier from where we join other travellers on a kayaking excursion for around two to three hours. We then drive on to our hotel on Nopparat beach. On arrival we check into our hotel for the next two nights, after which the rest of the day is free to enjoy this stunning location at your leisure. Renowned for its limestone outcrops, the region is littered with caves that have unearthed prehistoric rock paintings and artefacts that date back some 40,000 years, one of the oldest finds of human habitation in South East Asia. These caves are also one of the prime sources worldwide for the nests of the Swiftlet that is used to make bird nest soup. Please note: rooms are air-conditioned and have fans. Hot water is available at certain times of the day. A free day affords another opportunity to relax and enjoy the balmy serenity of these tropical shores, relaxing on the beach, or perhaps taking a walk through the surrounding area. Considered one of the most picturesque regions in southern Thailand, the area is blanketed in verdant vegetation, white beaches and numerous caves, islands and waterfalls just waiting to be explored. Alternatively you may wish to take the short trip to Krabi, to partake in an optional Thai cookery course, where an expert cook will teach even the most inexperienced the fundamentals of Thai cookery so that the fabulous cuisine can be recreated on your return home. For those looking for adventure farther afield there is the option to take a morning ferry to Phi Phi Island. Here, magnificent limestone cliffs rise out of the water while warm waves crash on the brilliant white sand. The undulating island is covered with rich vegetation and bright flowers and fringed with thatched roof houses. It was on Koh Phi Phi that the film The Beach was filmed. Transferring to the local pier we take a public ferry to the island of Koh Lanta, whose beautiful beaches have earned it the name of Pulao Satak by the local people (Island of the Long Beaches). Its white sands and forested hills present the ideal backdrop to our stay amidst the warm waters of the Andaman Sea and on our journey to the island we may even be accompanied by dolphins and flying fish, so keep your eyes peeled. On arrival we will transfer to our hotel and check in, after which the rest of the day is free to explore, or simply relax and take in the tranquil ambience of our idyllic surroundings. Inhabited largely by Muslims who arrived here from Malaysia 200 years ago, this beautiful island is some 25 kilometres long, with a steep ridge forming a forested interior. Parts of its lush interior are cultivated, but most villagers are still involved in the time-honoured occupation of fishing, much as their ancestors have been for generations. There are superb deserted beaches to wander along, or watch the fishermen pull in a catch, while children splash in the golden waters at sunset. This is the spot to forget your worries and relax and a Mai Tai cocktail, whilst watching the sunset offers a perfect end to the day. A free day on the island affords a wealth of opportunities to enjoy some optional excursions, including walks in the national park, a boat trip into the warm waters, or perhaps an excursion by bus around the island. The pristine waters of these shores present ideal opportunities for diving and snorkelling. A short boat transfer takes us to the beautiful island of Koh Hai, (sometimes called Koh Ngai), the least developed of the islands we stay on, and a true paradise that is perfect for exploring, with its fine white sandy beaches, clear water and vibrant coral reef. A landscape of ragged limestone outcrops and evergreen forests offer a spectacular backdrop to our stay here. Once we have checked in the rest of the day is free to enjoy as you wish. Our first full morning on Koh Hai sees us taking a boat trip to the nearby Trang Andaman Island of Koh Muk, where we stop off to visit the stunning Emerald Cave (Tham Morakot). An 80 metre swim along a limestone tunnel emerges at an inland beach, surrounded by enclosed cliffs covered in vegetation and an open pool of water that reflects the most beautiful emerald colour. This island is the perfect place to relax and unwind - perhaps taking the opportunity for further snorkelling or a walk through the forested interior to the other side of the island. Returning to Koh Hai the rest of our time on this glorious island is free to enjoy as you wish. You may like to take a walk into the forested slopes of the National Park, where crab-eating monkeys and monitor lizards travel down from the mountains to wander through the plantations of palms in search of food. Alternatively you can enjoy more of the spectacular reefs off shore, either from the beach, or by taking boat trips from the island. Another free day affords an opportunity to return to the forested landscapes of the National Park, or perhaps to take a speedboat to nearby Rok Nok or Rok Nai, to enjoy some snorkelling and shopping. Of course you may just prefer to soak up the idyllic majesty of our island paradise and relax by the warm waters of the Trang Sea. This evening there is the option to take a sunset cruise from Koh Hai, a fitting way to spend our final night on the islands, before returning to the city. After a free morning we take the ferry back to the mainland, from where we take the overnight train from Trang back up to Bangkok. After arriving in Bangkok the rest of the day is left free in this vibrant and bustling capital city. Our tour ends after breakfast. If you have time you may wish to wander through Chinatown for a different flavour of the city, or visit one of the many shopping malls and markets. Pack essentially for hot weather. Bear in mind that the region is tropical (humid) and that days can be very hot. Lightweight rainwear or an umbrella is advisable all year. Casual clothes are the most practical (something with long sleeves, and long trousers for evenings), and tight fitting garments should be avoided. Laundry facilities are available on the islands. A swimming costume is a must. Comfortable shoes and sandals. Flip-flops or Thongs are useful when hopping on and off boats. A small torch, insect repellent, water bottle. Bring a beach towel and high factor sunscreen. If you intend to do a lot of snorkelling we recommend you bring your own mask and snorkel, as local equipment is not always top quality. A disposable waterproof camera can be useful whilst snorkelling. Any qualified divers should remember to bring logbooks and certification with them if intending to dive. You should allow approximately US$25. We carefully select the accommodation on this relaxed beach-based trip to ensure a pleasant stay, in some cases the facilities at some of the island hotels are less sophisticated than in the city, with electricity supply and hot water availability being limited in some instances. This maybe because of restrictions in the mains supply or the hotels may need to generate their own electricity and do not wish to run their generators 24 hours a day. In the heat and humidity many people prefer a cool shower - note that where the bathing water supply is unheated, it will take on the surrounding air temperature so still be relatively warm! This trip to Thailand is a great way to escape our winter months. This is an excellent trip for first-timers to the country as it will give you a flavour of the culture in Bangkok but focus mainly on seeing the beautiful islands and beaches of the Andaman Sea in the south. You will be travelling using a mixture of overnight trains, public ferries and private buses really giving you a flavour of being in the destination, however plenty of free time is built in on the islands for you to fil as you please.